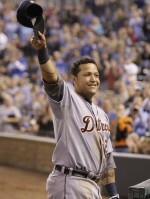 Miguel Cabrera is the 2012 American League Most Valuable Player. As viewed through any lens, Miggy meets the criteria. No one player brought more value to his team this year. He dominates the classic statistical battle and his numbers even hold up in many of the new school sabermetric statistics. Lastly, we’ll see how in baseball, more than any other sport, performances are viewed historically. So yes, Cabrera, with his newly earned crown and tickets to the World Series, is the clear-cut choice for MVP. Let’s begin by looking at the very nature of the award. This distinction is made each year when pundits make their arguments, but it’s necessary nonetheless. The award shall be given to the most valuable player, not the most outstanding player. If we were looking for outstanding, the man with the gaudiest stats and dominating performance would be the winner. What we are looking for though is value. I’ve made this argument on this website before, but in the 21st century we must reiterate the definitive objective of team sports. The goal of each player on each team is to win. Despite the numbers many fantasy freaks and stat geeks spend countless hours poring over, the only number that really counts is wins. Miggy led his Detroit Tigers to the AL Central division crown. The Mo-Towners were locked in a heated race with the White Sox for much of the season. Eventually the Tigers pulled away, won two playoff series, and now await their NL foes in the World Series. You see, in order to have premium value, a player must help deliver a desired outcome. The desired outcome of every baseball team that ventures to spring training is playoff baseball in October. That’s why I’m of the belief that an MVP should always come from a playoff team. Many (perhaps even a former roommate of mine) will argue that Mike Trout should be the MVP. Trout had, by any accounts, an historic season. I heard it argued earlier in the season that the 20 year-old rookie’s prowess at the top of the Anaheim order helped ease the transition to the team for Albert Pujols. Any adolescent that can take the pressure off an all-time great deserves special consideration for sure. But what has Trout been doing this fall? He played out of his mind, yes, but a second place finish and an early trip home can only be considered so valuable. (Let me take this aside to also acknowledge another second place LA team for taking horrible assets off the Red Sox’s books and garnering no perceivable pay-off. Thanks, Magic). But I know, I know…you readers need statistical evidence. Right now you’re thinking back to your Middle School math teacher, and remembering what a profound influence he had on you (note my day job). When it comes to hitters’ statistics, let’s start with the Holy Grail. Miguel Cabrera won the American League Triple Crown! He came in with a final tally of .330, 44, and 139. Tim Kurkjian, among others, has pointed out the increased difficulty of achieving this feat in an era when many players specialize in either contact hitting or the long ball. Think Ichiro on one side, and Adam Dunn on the other. Later we’ll see the historic importance of Miggy’s feat this year. Suffice to say, in tried and true measures, this man stands above the rest. What’s that you say? Bill James and Billy Beane and Theo Epstein have proved there are new, better statistics used to measure performance in baseball? Well friends, let’s take a foray into sabermetrics for a few minutes then. In this new era, GM’s and others have put a premium on On Base Percentage Plus Slugging (OPS). This statistic factors in hits, walks, hit by pitches, and the number of total bases reached. Cabrera stands at the top of the league (and all of MLB) looking down. Another statistic of increasing significance is strikeout to walk ratio. Miggy again dominates Trout and others with a very low 1.39. Now, no true sabermetrician would ignore the trendiest stat of all, Wins Above Replacement (WAR). This stat attempts to equate how many wins a team would achieve by playing the player in question over a theoretical baseline call-up from the minor leagues. The contributing factors include offense and defense, and provide a fascinating way to look at the game when fully understood. In this category, Trout leads Cabrera by a significant margin, 10.7 to 6.9. A large reason for this can be attributed to Trout’s athletic acumen in the field and on the base paths. And while Trout is a more superlative defender for sure, Cabrera provided valuable versatility in the field for Detroit this year. 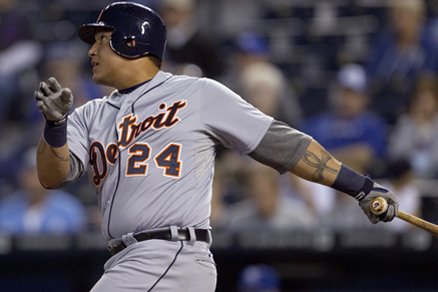 In order to accommodate their hefty new addition, Prince Fielder, the Tigers asked Cabrera to move back to third base. Miggy made the move and served the team well. These types of intangibles should not be ignored. In the era of Moneyball, the intangibles or “makeup” of a player may be devalued. But undoubtedly the case study of Derek Jeter vs. Alex Rodriguez should teach us not to ignore a player’s mental fortitude. This line of thinking may be more akin to those who view baseball from a romantic perspective. These fans and writers fell in love with the game years ago. Theirs is a game whose narrative grows year by year. In this game, Miguel Cabrera, the protagonist, created a historically significant story. (As an aside, many of the heralded baseball records have been marred by performance enhancing drugs. Cabrera’s only documented vice has been alcohol). Since 1878 there have been 134 baseball seasons, and two leagues in which a player could win a triple crown. Out of the possible 268 occasions in which a Triple Crown could have taken place, it has only happened 17 times. This feat has only happened just over 6% of the time! Only 15 different men have worn the triune jewels. Each player, with the exception of the two from the dead-ball era, is enshrined in the Hall of Fame. The roll call of prior kings includes names like Cobb, Gehrig, Williams, Mantle, and Yastrzemski. And now in 2012, for the first time in 45 years, we have a Triple Crown winner. This accomplishment truly stands out in the long history of the game. 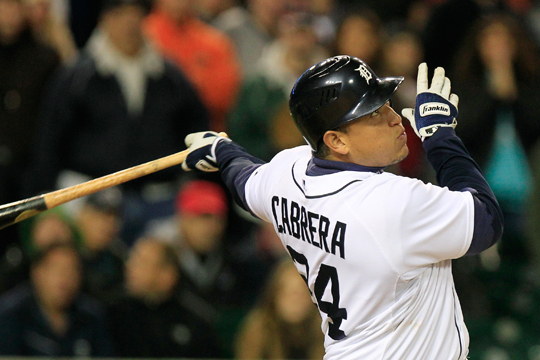 After a varied analysis of this season’s most valuable candidates, Cabrera emerges from the pack. His value, statistical superiority, and historical accomplishment bolster his resume. In a fall filled with choices this choice is clear: The Big Cat is the MVP.